It’s been quite a while since I’ve heard something truly inspiring appear on the breaks scene. 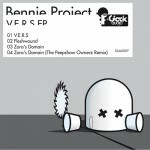 So I was pretty stunned when I heard the sounds of Bennie Project on a release by Hungary’s Glack Audio. The VERS EP is a collection of tracks from a man called Teun Verstraaten, based in The Netherlands. Three tracks on the EP have stayed in the box; V.E.R.S, Fleshwound and The Peep Show remix of Zora’s Domain, ultimately because they feature broken beats. The tracks feature a lot of contrast, building from haunting electro sounds into heavy growling electro bass, more in keeping with tearout breaks. The beats skip and repeat, keeping the mind interested and the quality of production is high. Here’s hoping there will be more of the same arriving in the pipeline, which will make Bennie Project a name to watch out for in the future breaks scene. Look out for his remix of Trackbasse, by Xenon and The Weekenders too. This entry was posted in Reviews and tagged Bennie Project, Breaks, Glitch, Review by shaman. Bookmark the permalink. Thanks for the nice review mate. all i can say is i wanna make sweet baby’s to bennie project’s music. bombaklap!